Another weekend, another event in the books. I forgot to mention in my last article that I would be working at the Aether Games booth for GP Charlotte this last weekend, so I’m telling you now: look for me at the Aether Games booth last weekend and make sure you say hello! Grand Prix events are often where metagames are cemented into place. Sure, we had a double header last weekend with the SCG Open and the SCG Invitational both including Modern in their schedule; so we had a pretty good idea of what to expect this weekend. Let’s take a look at the decks and associated cards and see how they fared this weekend. There was a lot of talk last week about this deck being “just too good” and that there was sure to be a banning because it was so overpowering. Well I did some detective work and a little independent research of my own: it turns out this deck is actually borderline crap. If you take a look at the results of the GP, there is only a single copy in the top 32 decks. Furthermore, that deck was piloted by a guy who wins so often that they added the word “Insane” into his name to illustrate the point – Alexander “Insane” Hayne. If we’re being fair, he could have piloted a ham sandwich to top 32 with very little effort. I wouldn’t worry about the sky falling any time soon on this one. Can it kill quickly? Sure, but you’re going to need to create your own starting hand – wait, that actually happened. This deck kills no faster and less consistently than Infect so expect a banning about the same time that we see Glistener Elf taken out of the format (0 Infect in top 32 FYI). This was the deck to beat this weekend after it finished first in both the SCG Open last weekend AND the Invitational. Urza’s lands, Oblivion Stone, All is Dust, Karn Liberated, and Wurmcoil Engines were all extremely popular cards this weekend. You’ll see a low representation of these decks in the top 32 because the deck had a giant target on it’s back. Expect prices on these cards, especially Oblivion Stone, to slow down a bit as most of the people that set out to build this deck have completed it and the lack of a top 8 finish is going to dull down the hype a little bit. Crucible of Worlds is one of the peripheral cards associated with this deck that many players “rediscovered” this weekend. Aintrazi had two copies in his sideboard last weekend along with two additional Ghost Quarters for the mirror match. Combine that with the casual appeal of Strip Mine locking all your best friends in Commander and you have yourself a dual-threat winner. This was expected to be a breakout weekend of the Splinter Twin decks, and it’s fair to argue that it was with two copies in the top 8 and eight of varying varieties in the top 32. Splinter Twin also has a unique relationship with it’s natural enemy Spellskite. One of my bosses pointed out this weekend that the two have seemed to form a symbiotic relationship, as one grows more popular the other does too. Expect these star crossed lovers to be entwined for a long time. One of the clutch sideboard plays to see camera time this weekend was Cavern of Souls + Teferi, Mage of Zhalfir to lock out an opponent from interacting with your swarm of Pestermites or Deceiver Exarchs. Teferi has already been seen putting in work in last year’s “Blue Moon” deck so he’s likely a card to watch going forward. Time Spiral was not a huge printing and FTV: Legends printings can only stretch so far. The other big winner from this deck is Snapcaster Mage, a long-term “obvious winner” for #mtgfinance heroes everywhere. StarCity has them listed at $99.99 now which is about as close to $100 as you can get without going over. I don’t know if this price is realistic or sustainable, but it’s there and if you didn’t listen to the dozens of finance wizards on this one, you probably missed out. A word of caution: now is not the time to buy in on this target, it’s at or near it’s peak and it is clearly on Wizards’ radar as a reprint target. Creature decks were long at the mercy of being required to play creatures at sorcery speed, opening a window for the combo players to “go off” without fear of you interacting. Collected Company allows these decks to play the “before the end of your turn” game just like the blue decks, shifting the balance and tempo of the match. Chord of Calling is a card that’s success is going to depend on Collected Company just like it did before with Birthing Pod. 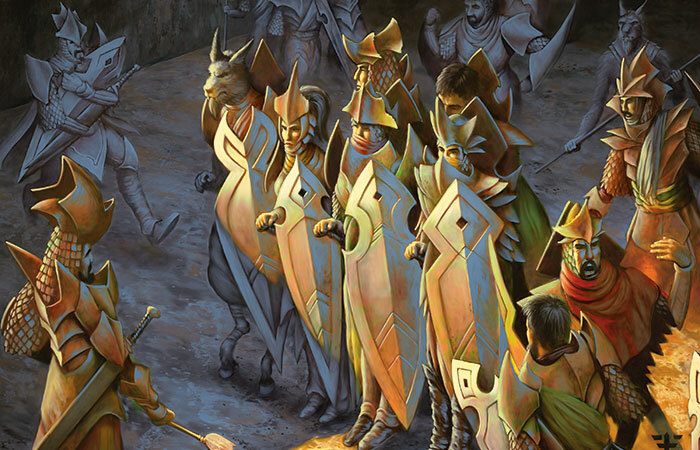 While we don’t see any copies in the Naya Company decks, it is critical to the success of the Abzan Company and the Elves decks. The ability to search out silver bullets at instant speed is critical to the success of these decks. This card is already seeing movement, but it’s definitely not too late to hop on this bandwagon as there’s plenty of room to grow and it’s unlikely we’ll see another reprint on this any time soon. Ezuri, Renegade Leader is another breakout winner from the elves deck. For far too long this guy has been teetering back and forth between being a $2 card and pure bulk… turns out that having a reusable Overrun on your person is a useful ability in an elves deck, especially with the help of Elvish Archdruid. Heritage Druid is another card from this deck that saw “speculation” hype take it above $20, but that train is running out of steam and it’s falling back down. This card is a pretty easy guess for ancillary products like Duel Decks, so I would only get what you absolutely need to play with. If you didn’t see this one coming for the last year or so, then you haven’t been playing attention. Any time you can cheat fatty boom booms into play, you’re a lock for shenanigans. This card is exceptionally more powerful than most in this category because it works on Emrakul, a card that’s supposed to dodge reanimation with it’s shuffle effect. Goryo’s Vengeance decks are likely tier 3 for the most part, but make it up by being tier 1 fun. If you have any doubt that this card has a cult-like following, just search #Griselbanned on Twitter and see the rabid salivating fans every time these cards show up on camera. Griselbrand is definitely not the spec here, with 2,000+ of these Grand Prix promos being handed out every weekend (8,000 in Vegas), the supply is more than keeping up with demand right now. Nourishing Shoal is an interesting one, but this card has already spiked 2,000% so I can’t imagine this niche card in a sub-optimal build of a tier 2 deck is realistically priced at $10, but it’s definitely cute pitching a Worldspine Wurm or a Borborygmos Enraged to to gain some more life to draw more copies and repeat. Speaking of which, Worldspine Wurm and Borborygmos haven’t even moved the dial on price changes, so if you’re feeling froggy and want to drop $10,000 soaking up all the copies of these cards available on the internet – have at it! Affinity is still Affinity. There’s always at least one copy of this deck that sneaks into the top 16 of a Modern event. It’s almost a mathematically probability that one of the million people playing this deck will get handed “can’t lose” pairings all day long and crack the top of the charts. We’ve already established the winners in this deck right now: Inkmoth Nexus, Arcbound Ravagers, and Glimmervoids should be your first pickups if this is a deck that interests you as none of them made the reprint list in the latest iteration of Modern Masters. I wouldn’t go too crazy on these as one of the biggest draws of playing affinity (or burn) is that the deck is (was) inexpensive to build, so players of this strategy are notoriously cheap. Tasigur, the Golden Fang appears to have bottomed out and will continue to show up in basically any deck that’s running black cards. As it turns out, one mana 4/5 creatures are pretty good. I still especially like FOILs of this card because they’re very modestly priced in the low $30s right now. Monastery Mentor saw dark days in the past but has found his niche and is growing in popularity. This is another card I really like in FOIL due to the almost certainty that it will show up in Modern, Legacy, and even some Vintage going forward. Expect a renewed interest in Legacy cards going forward as people take their “Modern Masters Money” and trade those cards into older formats. We saw this big time with the last Modern Masters, everything Legacy and Vintage related saw a surge in price as players traded away stacks of Modern Masters chaff for cards that they’d always hoped and dreamed for. Hey Madlem, thanks for your response to my tarmogoyf post last week. From what it sounds like, in regards to the Amulet Bloom deck being banned, it isn’t that it just kills quickly like Infect with the right draw, it’s that the Amulet Bloom player can play about 5 min of Solitaire and that makes for a lousy game play experience. These aren’t my words btw. We know Wizards hates for players to not have fun (no LD, no decent blue cantrips anymore, minimal combo in Standard) so some of the experts think Bloom will get the Ax somehow as it kills “reliably” on turns 3 or 4 or the Amulet player just gets to occupy the clock for far too long tapping and untapping and shuffling and bouncing etc. Burn can kill turns 3-4 as well and that won’t get banned, neither will Infect…it sounds as tho the operations of the Amulet Bloom deck are what might get it banned more than anything. The operations for Bloom are not near as bad as they were with decks like Second Sunrise and the deck is not proving to be overly oppressive in the format so I don’t think it’s going to get banned. If they do, well Wizards is ridiculous as this meets none of their criteria for banning. Kolaghan’s Command seems pretty legit in Modern based solely on it’s pairing with Snapcaster Mage, while it’s popularity will wax and wain… it seems pretty legit and is extremely flexible. I’m not sure what’s going on with Siege Rhino in Modern, it could just be that the value of Collected Company has pushed it out as the defacto 4-drop for the Abzan decks, but I have a feeling that we haven’t seen the last of Siege Rhino. I also have a FOIL playset and my plan is to ride it out. Thanks man. Is Siege Rhino good or bad in a Jund world? I can only assume that he’s good vs the other “fair” decks. I also think Siege Rhino and Abzan are going to be the deck to beat after rotation (as if Rhino and Abzan aren’t now). I think people will finally figure out that Rhino, plus Tasigur, Sorin, Abzan Charm, Murderous Cut, Anafenza, etc is stupidly powerful. When the pro-white Stormbreath is gone I think a lot of these cards will have new or rejuvinated life (maybe Wingmate Roc will be resurrected). Also Rabblemaster rotating should help Abzan. The only thing that might hold it back is the loss of Caryatid and Courser which I don’t think a lot of Abzan is playing these days anyways. We’ll see, I do hope he rebounds though. Why did Abzan fall off the map in Modern?? I really just think the lack of Rhino in Modern is because the Abzan Collected Company deck is just more powerful and flexible than just powering guys through. That said, it’s only a matter of time before cards like Anger of the Gods push the small guys out of the way and give us good reason to bring back the fatty boom booms.